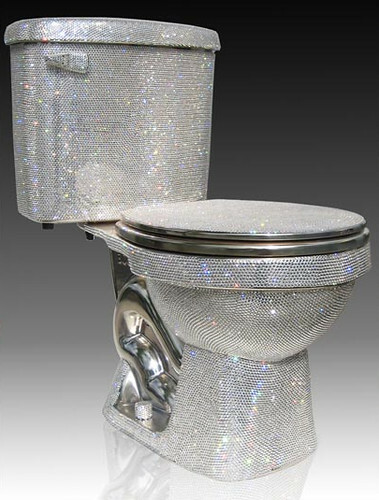 Yes, the diamond encrusted toilet from designer Jemal Wright goes for the low low price of $75,000. Yet, despite its obvious glamor, I don't really know that I need my latrine to be encrusted... it sounds unsanitary. Apparently he recently started melting it down and selling it off because the global economy is, quite frankly, crap, and now gold is crazy valuable. Thus his golden sink is worth a goose or two. But he says he's keeping the toilet no matter what, and I can't really blame him. It seems warm and oh so soft when compared to cold hard porcelain. Do you think they make gold potty paint? Can you imagine what my dear hunny bunny would say about that? 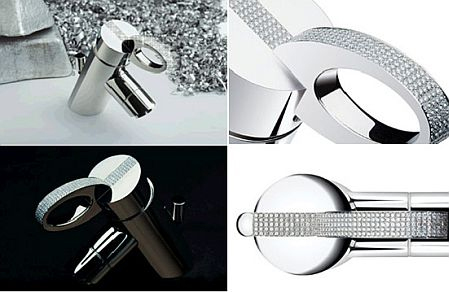 I bet he would like these diamond encrusted faucets; he's such a sucker for gadgets. No, a toilet does not qualify as a gadget. Maybe it's just the marketing and slick photography, but I can totally envision these gleaming white gold faucets in my house. You know, right next to the mountain of diamonds I keep on my bathroom sink. Oh wait, this line of bathroom accessories is "strictly for those with the taste and means to enjoy such an exclusive pleasure." Guess I'll just take my bucket of lime and head to the outhouse -- but not without my roll of colored toilet paper from Spanish supercompany Renova. It's only four times as expensive as regular old Charmin, but it comes in always stylish black. Now that is the bathroom I want! But is the top hat included?